I'm still sick, but not so sick that I can't sit around and write like I did last week. I've had all day shopping trips/doctor's appointments and basically? 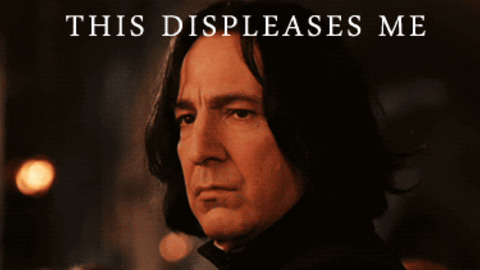 Me too, Snape. Me too. Last week when I posted. I had 6k, almost 7k. Right now? I'm at 8k 8628 words if you want to know exactly. I've been trying not to get down on myself for not writing very much, but it's hard. A good friend reached 50k today. It's hard feeling so behind. I just have to remind myself that it's okay to go at your own pace, it's okay that life happens. We're leaving on vacation this Saturday, so this week will be busy with packing and planning, so writing will probably be limited next week too. But it's okay if I'm behind, because I can catch up. It's okay if I don't win. It's okay if i publish this post that I'm writing at 10:30 at night. And now I shall sleep. And/or write. Goodnight. 8,600 is 8,600 more than you started with and I BELIEVE IN YOUU. Good luck with the rest of NaNo!